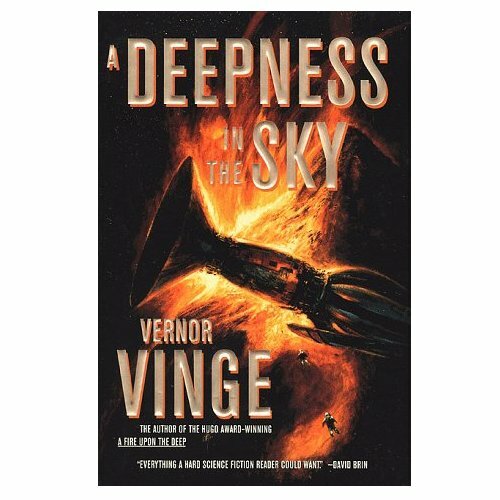 I have been reading for the past four months a great space opera book by Vernor Vinge, A deepness in the sky. It indeed took me some time to finish it, but it is one of the best, if not the very best Sci-Fi book I ever read so far. As I just finished it, I will give you my appreciation on it. This 1,000 pages book ( 800 for the English version ) tells the tale of two different space travelling civilisations discovering at the same time an odd and far planet. OnOff, the name of the planet, is the home of a species looking alike our spiders. This world is at the same technological development stage that Mankind was in the first part of the XXth century. The two space travelling civilisations are totally different in their behavioural and cultural aspects. As any good tale, there are the Good and Righteous and the Bad and Evil folks. If you include to these partakers the two others that can be found on OnOff, you get a double chess game the reader will follow during centuries and light-years. The Good guys in space are the Qeng Ho, which only live for making business in the various parts of the Galaxy they are in. They are business people and have been trading technological information for centuries. The Qeng Ho technology is just the evolution, thousands of years later, of what the ” Old Earth ” is now. It is very funny to read the Qeng Ho mentioning the Dawn of Mankind with the computers we have and how slow they are. I indeed like to see this book as a possible description of what Mankind could become in thousands of years if it was to beat all odds and tackle the problems of their era. The technology that is dealt with include tiny computers, cryogenics and so on. The Bad guys are the Emergents, a nation of tyrannical and sadistic people whose only ambitions are to command and conquer the others. To gain power, everything can be done, including brain-washing, torture and mental enslavement. Emergents’ style is dictatorship,when the Qeng Ho are more open to discussion, as well as trade and technology oriented. The reader hence wants to see who will win and in which conditions. On the ground, we have also two sides, with the Good “spiders” and the bad ones. Both Qeng Ho and Righteous spiders are profoundly likeable because of their human characteristics and traits. They are dealing with treason, death, life, love and so on as we are doing our own way. This masterpiece also gives a grasp of how fascinating a multi cultural environment can be with the various cultures trying to live within or against the others. Just this makes the book interesting. If you add to this a great story, a fascinating plot, life-like characters and so on, you will begin to understand why I am so enthusiastic about this book. But what makes this book a perfect 20/20 is the coherence of everything. There is absolutely no flaw, or at least I found none in the whole book. Concerning the story itself, the book is divided in three parts. The first one is rather short and sets the play and the various partakers. The second composes most of the book. In that long part, most of the action set place with various treasons, Emergents’ villainy and so on. The third part, the two chess games with the four players are on the same level, and the war, which has been preparing for a long time, finally takes place. The collision of the two levels is just fantastic. I won’t spoil the fun, but just be aware that the last part of the book is absolutely great and you will be wishing you could read faster to know what will happen next. Another thing I liked in this book is that some of the Qeng Ho are living into couples or are willing to live as couples. When two characters unite, the reader sees a symbiosis being born with each side giving the best and thus making the two worth of plenty. A very nice way to see love. To make a long story short, and to infer this article, if you like Sci-Fi literature and are quite keen on space Operas like Star Wars, read A deepness in the Sky, you will be as thrilled as I have been. I will certainly re-read this book one day and its sequel A fire upon the deep. The stories are not related to and are independent but take place in the same Universe created by Vernor Vinge. My appreciation : Definitely a must read in the Sci-Fi genre. 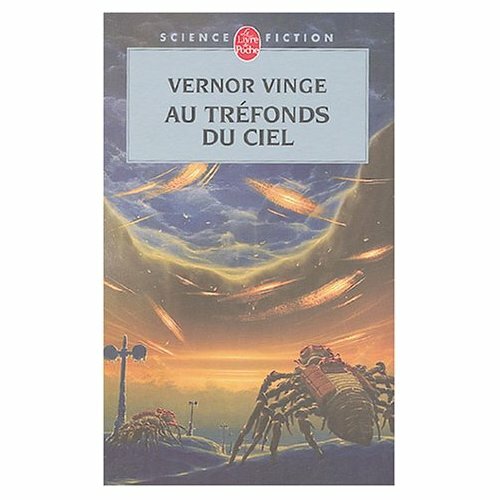 Original English title | French title : Au tréfonds du ciel. hi Edouard ! I liked this novel so much, it’s really a big book … I just want to class it with Foundations’ series of Asimov !! !